Will White move into OSU starting lineup? Ohio State head coach Urban Meyer said the Buckeye defense is getting better in the tackling department. Ohio State’s Jonathon Cooper (left) and Ohio State Malik Harrison (middle) close in on Nebraska’s quarterback Adrian Martinez in the second quarter at Ohio Stadium on the campus of the Ohio State University Saturday. 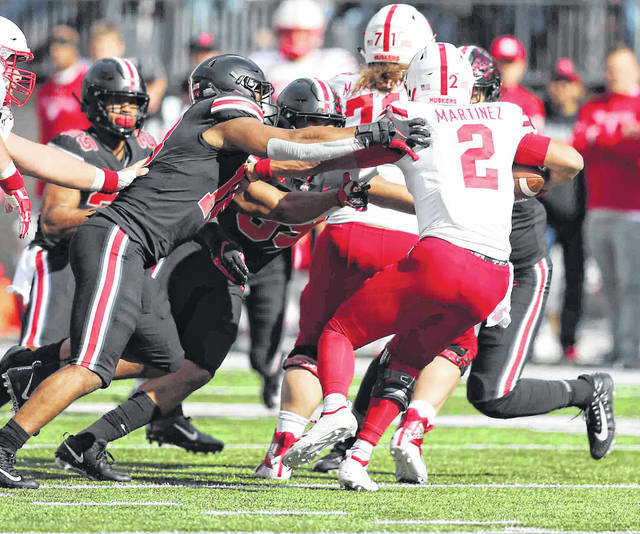 COLUMBUS – All it took was 13 tackles, two tackles for losses and a big stop to keep Nebraska’s Devine Ozigbo out of the end zone to transport Brendon White from afterthought to one of the hottest topics of discussion at Urban Meyer’s weekly press conference on Monday. White might have played the best game by an Ohio State safety this season and certainly had the best game by an OSU safety not named Jordan Fuller in the Buckeyes’ 36-31 win over Nebraska last Saturday. So, will White be the answer at a position that has been a trouble spot for Ohio State all season, Meyer was asked. Could the sophomore son of four-year Ohio State starter William White, a Lima Senior graduate, be on the verge of becoming a starter? “Those decisions will be made in the next couple days,” Meyer said. White had five tackles in OSU’s first eight games. Without Fuller being ejected for targeting, he would have been a part-time player against Nebraska, going into the game on third-down situations. “Going back to spring time safety was not a solidified position. We have to play much better at that spot. We had some injuries, then obviously the targeting call, and he’s in the game,” Meyer said about White. RUN AND SLIDE: Obviously, Dwayne Haskins is a very different type quarterback than J.T. Barrett, who ran for 3,263 yards in his career at Ohio State and Braxton Miller, who rushed for more than 1,000 yards in two seasons. Haskins, who has passed for 3,053 yards in nine games this season, has rushed for only 45 yards. When he has run, the sophomore QB has often looked uncomfortable. Meyer said the goal is for Haskins to get as many yards as possible but also to stay out of harm’s way. “You’d like to see him get all he can and then get down. Get as much as you can and get down,” Meyer said. ASSESSING MICHIGAN STATE’S DEFENSE: “They’re playing as good a defense as there is in the country,” Meyer said about Michigan State, which leads the country in fewest rushing yards allowed per game (71.7). MISSED TACKLES: Meyer said OSU’s much-criticized linebackers are improving but they need to get better at tackling. “I see improvement. But we still have too many missed tackles. We had six or seven tackles for losses that we missed (against Nebraska),” he said. OFFENSIVE LINE HEALTHY: Meyer named Ohio State’s offensive line the Offensive Player of the Game for the Nebraska game. “Our offensive line played very well. They’re very healthy now. They had two excellent weeks of practice and they were confident going into that game,” he said. FARRELL IMPRESSES: Tight end Luke Farrell “played very well, it was arguably his best game,” Meyer said about Farrell’s performance in a 36-31 win over Nebraska last Saturday. Farrell caught three passes for 33 yards. His longest catch went for 17 yards. https://www.limaohio.com/wp-content/uploads/sites/54/2018/11/web1_OhioState-FB-vs-Nebraska-DS12-1.jpgOhio State head coach Urban Meyer said the Buckeye defense is getting better in the tackling department. Ohio State’s Jonathon Cooper (left) and Ohio State Malik Harrison (middle) close in on Nebraska’s quarterback Adrian Martinez in the second quarter at Ohio Stadium on the campus of the Ohio State University Saturday.